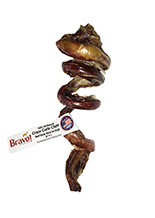 Home > Chews, Cookies & Treats > Curlys Small Tendon 6" -8"
Curlys Small Tendon 6" -8"
Curlys Small Tendon 6" - 8"
As one of the top selling treats at The Doggie Bag, these spiral chews are made from a beef tendon and dog's love to chew them! The unique design creates a natural chewing friction against the teeth which helps to reduce plaque. We have not met a dog yet who has turned down one of these tasty treats. All natural, no artificial colors or preservatives. Ingredients: Beef tendon sourced from the USA and made in the USA.